Our Outlook (and Outlook+) verandas are ideal for homeowners who want to enjoy their outdoor spaces to the full and stay outside even when the weather takes a turn for the worse! Each Outlook veranda has a robust polycarbonate roof that’s tough enough to withstand just about anything the weather might throw at it. For a more open aspect the + series of SunSpaces includes an enhanced gutter with fewer support posts to improve your unobstructed view. Whether you need space to work, space to play, space to dine, or space to just relax and unwind with a good book, we are certain that an Outlook garden veranda from SunSpaces will suit you perfectly. With a wide range of standard and bespoke options on offer, we can help you to create an outdoor living space that’s perfectly in sync with your home. 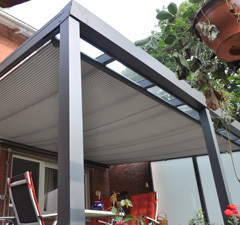 To find out more about our Outlook polycarbonate verandas, please email info@sunspaces.co.uk today. 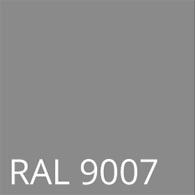 Alternatively, click here to request a quote, complete with a complimentary design for your new veranda! Don’t want to build your own veranda? No problem – let our installation team do it for you! 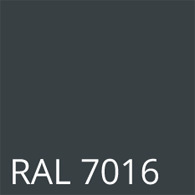 This product is manufactured according to German construction standards, ensuring a guaranteed strong, safe and solid system and has been EN 1090-1 certified since January 2016. 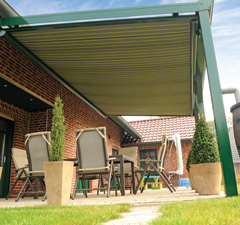 The Outlook veranda comes with a standard gutter cover (see below). The Outlook+ veranda comes with an enhanced gutter (see leftsee above). We also offer a range of alternative gutter covers. Consider your options for gutter covers below. 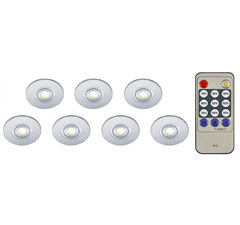 Light up your nights with this set of 6 LED’s, complete with transformer and remote control. 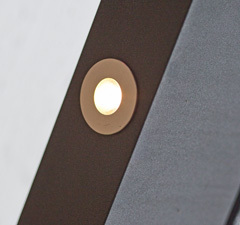 Manufactured in Germany these lights will help illuminate your outdoor evenings. We supply a comprehensive range of heaters (including an innovative heating and sound system – see the sound section below). You can choose from a range of high-quality heating products - view them all here. 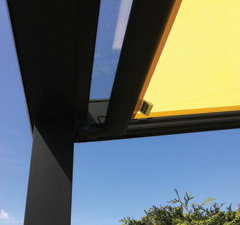 We also offer a manual sunblind for the Outlook Veranda. With in-built UV resistant fabric, this sunblind is available in three colours and in a variety of fabric options (See RightSee Above). 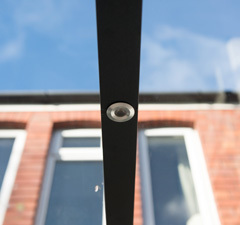 Flick between shade and sun quickly and silently with this bespoke electric sun blind. The fabric incorporates built in UV resistance to stop fade, and the blinds are available in a range of colours (See Images Below). This innovative system is a heater with an integrated Bluetooth stereo. This dimmable heater provides a golden glow and this combined with the ability to play music really does help set the scene. The heater and speakers can be controlled via remote control or by using an app. "Sorry just got home from work. The veranda looks amazing. My wife is totally blown away. Your work men where a total credit to your company. They where professional and polite and of course supplying a first rate job. 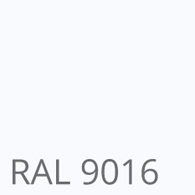 On a again awesome can you thank them from us. Thank you again and I will ... "